My name is Bartek, I'm a programmer from Cracow/Poland. This is my blog about C++ and native coding. You can read more about me and the blog in the About section. Or see the Archive page with all blog posts. And, there's also the Start Page with the selection of best articles. Last Tuesday, 16th April, I had a pleasure to talk about std::filesystem in our Cracow C++ User Group. Here are the slides and additional comments. In the first part of the series we looked at lambdas from the perspective of C++03, C++11 and C++14. In that article, I described the motivation behind this powerful C++ feature, basic usage, syntax and improvements in each of the language standards. I also mentioned several corner cases. 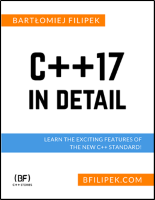 Now it’s time to move into C++17 and look a bit into the future (very near future! ): C++20. 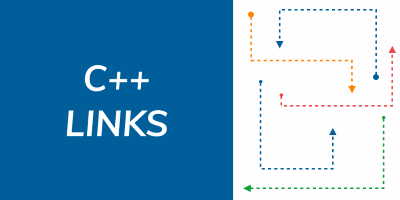 Welcome to new C++ Links - most important and useful articles, podcasts and videos that happen between 2nd and 8th of March 2019. This week you will find links to articles about accepted Modules proposal, a great MSVC improvement that is reducing binaries with C++ exceptions by 20% and many more! I released “C++17 In Detail” in August 2018, and I set the status to 90%. I didn’t expect that writing of that remaining 10% would take me so long :) Now it’s high time to set the counter to 100%. That’s why I’m pleased to announce that my book “C++17 In Detail” is now done! See the recent changes and a new code sample! Welcome to new C++ Links - most important and useful articles, podcasts and videos that happen between 23rd February and 1st of March 2019. This week we have a massive update on the upcoming C++ Standard - Kona Meeting reports. 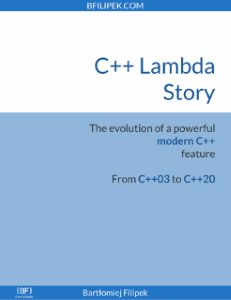 Then you can also read about the history of lambdas, about smart iterators and more. Lambda expressions are one of the most powerful additions to C++11, and they continue to evolve with each new C++ language standard. In this article, we’ll go through history and see the evolution of this crucial part of modern C++.